For more than 40 years the Osterbrant AB company has designed, produced and delivered the alarm and indicator unit PILOT B10. The Alam and indicator unit PILOT B10 is distributed worldwide and more than ten thousand units have been delivered to many different customers in the power generation and distribution, construction, manufacturing industries etc. Our specialities are producing to specific customer requirements and rapid delivery. High quality and reasonable prices come as standard. We will customise each unit to the customer´s specific need. We will be able to deliver within a few days. The PILOT B10 alarm and indicator unit is designed for use in industrial and similar environments. The PILOT B10 provides alarms and indications units for automatic control and supervision of processes, machinery, power plants, buildings, etc. The PILOT B10 will require additional protection if installed externally. The PILOT B10 is not intended for use as burglar alarm, fire alarm, assault alarm, social alarm, camera supervision systems or access control for safety applications. The PILOT B10 is available in many types and is adaptable to different applications, specified by the customer. All base units have the same dimensions and electrical connection features. Any unit can be exchanged or replaced with other types of units. The PILOT B10 fulfils the requirements for the European Market (CE). The PILOT B10 alarm unit is equipped with a microprocessor, programmed to give the alarm unit its functions. The unit is protected by a standard polycarbonate DIN-enclosure, 96x96mm. All indication lamps are provided by LED´s. Each unit has ten LED´s (channel indication lamps) located vertically with a text area on the front panel. Alarm LED`s are located at the top of the unit to indicate the status of a failure. There are push buttons for Reset and Test. Power, failure contacts and summary relay output are connected to a terminal at the rear of the unit. A mounting clamp is provided for mounting of the unit. The software included is not affected, disturbed or dependent on date, clock time, calendar year, turn of year or leap year. In the event of an alarm signal resulting from a closing or opening contact, the summary relay will be activated after a preprogrammed time delay. The alarm LED lights up and the corresponding channel lamp flashes simultaneously showing the location of the failure. After the failure is rectified the alarm remains active until the Reset-button is pressed. If the failure remains after pressing Reset, the alarm LED darkens, the summary relay is released and the channel LED changes to a steady light. When the failure disappears the channel indication light darkens. A functional test is activated by pressing the Test-button. This causes all LED´s to flash and the summary relay to activate. There is an option to exclude the summary relay from the test. 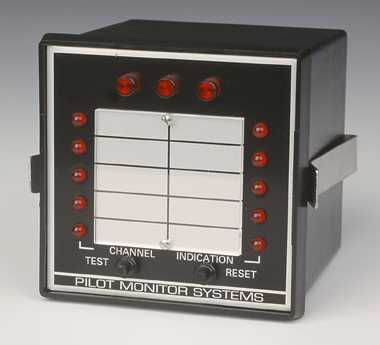 The PILOT B10 is intended to be installed permanently in a stationary cabinet or similar housing. Only the front panel of the unit should be accessible to an operator. There should be external means for switching off the voltage supply when opening the enclosure for any purpose. The enclosure shall be opened by authorised personnel only. The units in the PILOT-series are equipped with electronic parts. Some units content lead acid batteries. Scrapped material shall be handed over to an authorisied company for recycling or be sent back to Osterbrant AB. Specification: all important data, functions and test approvals. Product List: a selection of alarm and indicator units. Accessories: additional functions and options. All types of units can be adapted to different needs and a variety of functions and accessories described in this document or implemented as specified by the customer.